I recently completed an intro package to flying and I learned a lot about what it takes to become a pilot. I’m documenting the steps along with the money and time needed because I couldn’t find a realistic viewpoint anywhere else. None of this has to be done within a certain amount of time, although the written FAA exam results are only good for 2 years, so if you take longer than 2 years going through steps 3-8 you’ll have to take it again. Books, flight calculators and accessories – $500. Overall it should take about $10,000 to receive your pilot certificate. I’m told that there are several ways to bring the cost down, such as if you need to travel for work you can write that off, or if you take a group of friends somewhere you can split the cost with them (although you cannot charge people for flights, as you need a commercial license to do that). Flight time – about 60 hours. Most schools say you can get it done in 35 hours, but no one has ever known anyone to do it that quickly. Average is 50-70 hours. Although this does not expire, the quicker you do this the better, otherwise more of your subsequent lessons will be focused on review. Recommendation is to do 1-2 hour flights per week. Flight time includes taxiing. Studying for tests – not sure, every student is different, but plan on time for this too. Overall it will take just over a year to get all this done if you follow the recommendations, but can be several months before or after depending on how often you choose to fly. FAA requires 3 landings every 90 days. Some flight clubs will require more (usually 5 landings every 90 days). FAA Flight Review every 2 years. This includes 4 hours of classroom instruction, 1 flight, and a medical exam. So once you have it, you have to do these things to keep it valid. Will be a minimum of about $2000 and 20 hours per year. It’s a lot to overcome, but it’s not unmanageable! Hope this helps and good luck if you do decide to become a pilot! Every 3 months they start a “Ground School Training” program. It’s one of the requirements you need to complete as part of becoming a pilot, and they let you sit in on two of these sessions. It’s basically a small classroom at their facility at Gillespie Field, holding probably about 20 people. The instructors are great, very knowledgeable, very passionate about the subject. I’d recommend going towards the start of the series, as if you’re doing an intro package you probably only need to know the basics (basic aerodynamics such as lift, stalls, flaps, turns). They have videos to most of their sessions available for anyone to view online. They book they provide was nothing special. You’ll be alongside other students who are there to get their license, so they have other books and a bit more training than you. They have homework and quizzes, but since you’re just sitting in you don’t have to worry about it. 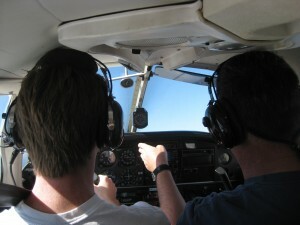 Instructor did the take off, but within about 30 seconds of take off, he passed the controls over to me and I was flying! Practiced ascending and descending to certain altitudes, then trimming the elevator so that you didn’t have to constantly hold the stick in position and could relax (basically like setting cruise control for the steering wheel of a car). Practiced turns – it’s very different from driving a car. In a car you just turn left/right. In a plane every time you turn you must move 3 different controls at once: ailerons to bank (lower one wing relative to another), rudder to prevent slipping (turns like a steering wheel does to a car), and elevator up (otherwise you’ll lose altitude). It’s a choreographed set of movements for these 3 controls every time you turn, and it takes some getting used to. 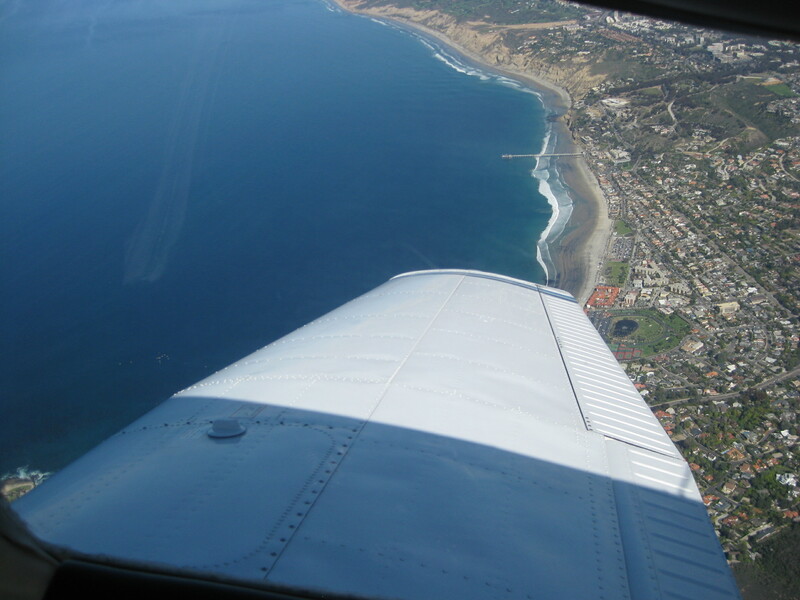 Practiced straight and level flying while extending flaps to various degrees (flaps provide lift and allow you to descend without gaining too much speed). Instructor showed the types of stalls (when you lose aerodynamics of the wings due to speed or angle and you start falling out of the sky) and how to recover from them. A little scary but very cool! Our route: west to the coast, then north along the coast up to Del Mar, then east to get back to land. My girlfriend came expecting to just watch us take off, but my instructor let her come with! She sat in the back seat and got to take pictures and videos the whole time. She got a little motion sick at the end, but she hung in there! About a minute before landing the instructor took back the controls and did a trick landing (side-slip). Was one of the smoothest landings I’ve ever felt. Did inspection of airplane, fuel, engine. I taxied until take off, which my instructor did again. Our route: East to an open training area, then south down to Brown Field. Then back to Gillespie. We did the same sort of exercises as before – turns, ascents, descents, flaps – although it was much easier this time. I was starting to get the feel of the plane. We landed at Brown Field (small airport just near the Mexico border) for a touch and go. My instructor said if I feel comfortable he’d be happy to walk me through the take off! I gladly accepted and took off – was a little scary, but he led me through it and had no problem at all! Once back near Gillespie he did a short field landing – was very impressive. I’m pretty sure they’re losing money by offering all of this for under $150, as individually it’s about $400. My guess is they hope you become hooked and commit to becoming a pilot through them, as that’s where they make their money. I’m not sure I have the time and money to commit to becoming licensed, but this package was WELL worth it and I really hope I inspire you to try it!! !